The Colon Post office, established in 1835 by Lorousi Schell-hous, has served the community with postal services and prod­ucts for over 160 years. In October of 1960, the office was moved to its present location at 123 S. Blackstone Avenue. 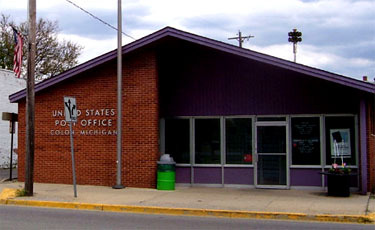 The Colon Post office has 580 post office boxes and two rural routes for the delivery of the mail to approximately 1,685 residents. The post office offers a variety of services. Express mail is a guaranteed delivery, most areas are next day. Priority mail is a two to three delivery. Our newest offer is global priority mail. We sell many packaging products, boxes of all sizes, tape, padded envelopes, and regular envelopes. Stamps and philatelic items are also available for the stamp collectors. Outgoing mail is cancelled in Kalamazoo and distributed there to other areas. Stamp lobby hours are: 9:00 a.m. to 12:30 p.m. – 1:30 p.m. to 4:00 p.m. Monday through Friday, and 8:30 a.m. to 10:30 a.m. on Saturdays. The lobby hours are: 7 a.m. to 8 p.m. Monday through Friday, and 7 a.m. to 6 p.m. on Saturdays. This entry was posted in General Info and tagged Post Office. Bookmark the permalink.